Parking in the wrong space could make your car gets a ticket or even towed. 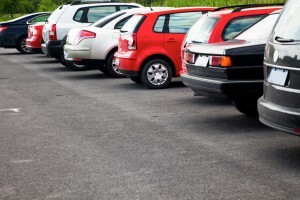 Check out some tips for apartment parking etiquette. When you finally score that prime parking space, it can feel like winning the Olympics. But do you have the right to park there? Parking in some spots around your apartment complex could mean encoring the wrath of your neighbors. Let’s take a look at some apartment parking etiquette to keep everyone happy. This may seem like a no-brainer, but don’t park where you aren’t allowed to park. This could include a parking spot belonging to your neighbor, in front of the dumpster, in no-parking zones, double parking, or in guest parking. If you are not allowed to park somewhere, don’t. Park only in your designated spot or spots and tell guests to park in the visitor parking only. While it may look and feel good to speed out of the parking lot, this is actually extremely dangerous for the adults and kids who frequently walk around the parking lots. Obey the speed limits. You may think no one saw you hit your neighbor’s car, but chances are in a large apartment building, someone saw. Just own up to your mistake and write them a note. You’ll sleep better at night. No one likes that person who parks at a weird angle, leaving them no room to get out of the car. So don’t be that person. Keep your car straight between the lines so your neighbors have room to get out of the car, unload their groceries, and get their kids out of the car without scratching yours. If your neighbor is having a party and someone parked in your space for the first time, let it go. Tell your neighbor in the morning to have them park somewhere else next time. If this is the tenth time someone has parked there, writer a friendly reminder on a sheet of paper or call management to deal with it. The bottom line, be nice. Being nice about it will make living at Harborside Village Apartments a much nicer place to live. Apartment Parking Etiquette with Harborside Village Apartments! This entry was posted on Friday, July 29th, 2016	at 3:15 pm	. Both comments and pings are currently closed.